The sites former use as a boiler works resulted in heavy metal and hydrocarbon contamination of the soils. The site’s proposed end use was residential properties with gardens, and flats with associated soft landscaping. VertaseFLI identified metal and hydrocarbon hotspots, in addition to a large quantity of broken sheet bonded asbestos and Japanese Knotweed. Human health and groundwater risk assessments produced site specific remedial targets for the remediation works. The human health risk assessment produced two sets of criteria - those soils suitable for re-use on site beneath a ‘no dig’ barrier which would prevent mixing of the contaminated material and clean imported soils; and material suitable for reuse above the ‘no dig’ barrier. 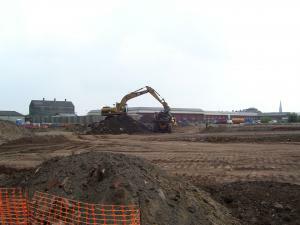 The containment of 500m3 asbestos contaminated soils on site, capped with a ‘no dig’ barrier. Hand picking of asbestos fragments. 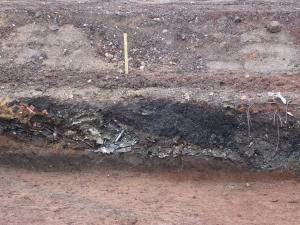 Excavation and offsite disposal of metal and hydrocarbon hotspots as part of a reduced level dig. Hotspot voids were validated and backfilled with chemically suitable site won materials. Earthworks comprising cut and fill across the site to finished site levels. This included the management of contaminated construction arisings so soils that posed a risk to human health were placed beneath the ‘no dig’ barrier, thus minimising offsite disposal of material. A contract completion report produced to validate the remedial works signed off by the appropriate regulators. The treatment of Japanese Knotweed through a series of spraing visits over a two year period.